Human activities have greatly increased carbon dioxide levels in the atmosphere and nitrogen levels in the biosphere. Altered biogeochemical cycles combined with climate change increase the vulnerability of biodiversity, food security, human health, and water quality to a changing climate. Explore interactions between climate change and biogeochemical cycles. Biogeochemical cycles involve the fluxes of chemical elements among different parts of the Earth: from living to non-living, from atmosphere to land to sea, and from soils to plants. They are called “cycles” because matter is always conserved and because elements move to and from major pools via a variety of two-way fluxes, although some elements are stored in locations or in forms that are differentially accessible to living things. Human activities have mobilized Earth elements and accelerated their cycles – for example, more than doubling the amount of reactive nitrogen that has been added to the biosphere since pre-industrial times.6,24 Reactive nitrogen is any nitrogen compound that is biologically, chemically, or radiatively active, like nitrous oxide and ammonia, but not nitrogen gas (N2). 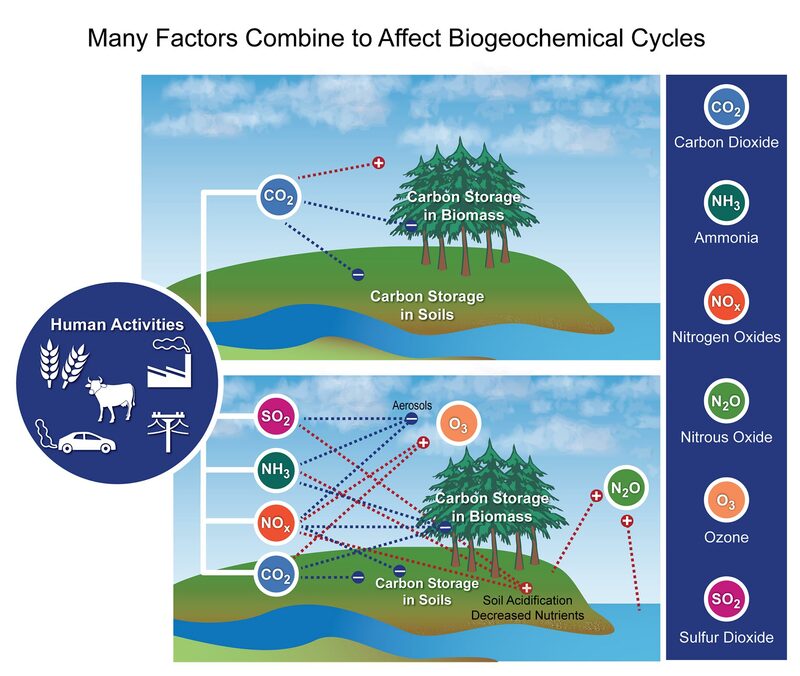 Global-scale alterations of biogeochemical cycles are occurring, from human activities both in the U.S. and elsewhere, with impacts and implications now and into the future. Global carbon dioxide emissions are the most significant driver of human-caused climate change. But human-accelerated cycles of other elements, especially nitrogen, phosphorus, and sulfur, also influence climate. These elements can affect climate directly or act as indirect factors that alter the carbon cycle, amplifying or reducing the impacts of climate change. Climate change is having, and will continue to have, impacts on biogeochemical cycles, which will alter future impacts on climate and affect our capacity to cope with coupled changes in climate, biogeochemistry, and other factors. Human activities have increased atmospheric carbon dioxide by about 40% over pre-industrial levels and more than doubled the amount of nitrogen available to ecosystems. Similar trends have been observed for phosphorus and other elements, and these changes have major consequences for biogeochemical cycles and climate change. The key messages and supporting text summarize extensive evidence documented in two technical input reports submitted to the NCA: 1) a foundational report supported by the Departments of Energy and Agriculture: Biogeochemical Cycles and Biogenic Greenhouse Gases from North American Terrestrial Ecosystems: A Technical Input Report for the National Climate Assessment,3 and 2) an external report: The Role of Nitrogen in Climate Change and the Impacts of Nitrogen-Climate Interactions on Terrestrial and Aquatic Ecosystems, Agriculture, and Human Health in the United States: A Technical Report Submitted to the U.S. National Climate Assessment.1 The latter report was supported by the International Nitrogen Initiative, a National Science Foundation grant, and the David and Lucille Packard Foundation. Author meetings and workshops were held regularly for the foundational report,3 including a workshop at the 2011 Soil Science Society of America meeting. A workshop held in July 2011 at the USGS John Wesley Powell Center for Analysis and Synthesis in Fort Collins, CO, focused on climate-nitrogen actions and was summarized in the second primary source.1 An additional 15 technical input reports on various topics were also received and reviewed as part of the Federal Register Notice solicitation for public input. The entire author team for this chapter conducted its deliberations by teleconference from April to June 2012, with three major meetings resulting in an outline and a set of key messages. The team came to expert consensus on all of the key messages based on their reading of the technical inputs, other published literature, and professional judgment. Several original key messages were later combined into a broader set of statements while retaining most of the original content of the chapter. Major revisions to the key messages, chapter, and traceable accounts were approved by authors; further minor revisions were consistent with the messages intended by the authors. The author team evaluated technical input reports (17) on biogeochemical cycles, including the two primary sources.1,2 In particular, one report1 focused on changes in the nitrogen cycle and was comprehensive. Original literature was consulted for changes in other biogeochemical cycles. The foundational report3 updated several aspects of our understanding of the carbon balance in the United States. The sources of C, N, and P are from well-documented processes, such as fossil fuel burning and fertilizer production and application. The flux from some processes is well known, while others have significant remaining uncertainties. Some new work has synthesized the assessment of global and national CO2 emissions16 and categorized the major CO2 sources and sinks.1,3 Annual updates of CO2 emissions and sink inventories are done by EPA (for example, EPA 201317). High confidence. Evidence for human inputs of C, N, and P come from academic, government, and industry sources. The data show substantial agreement. The likelihood of continued dominance of CO2 over other greenhouse gases as a driver of global climate change is also judged to be high, because its concentration is an order of magnitude higher and its rate of change is well known. The human mobilization of carbon, nitrogen, and phosphorus from the Earth’s crust and atmosphere into the environment has increased 36, 9, and 13 times, respectively, compared to geological sources over pre-industrial times.5 Fossil fuel burning, land-cover change, cement production, and the extraction and production of fertilizer to support agriculture are major causes of these increases.1 Carbon dioxide (CO2) is the most abundant of the heat-trapping greenhouse gases that are increasing due to human activities, and its production dominates atmospheric forcing of global climate change.15 However, methane (CH4) and nitrous oxide (N2O) have higher greenhouse-warming potential per molecule than CO2, and both are also increasing in the atmosphere. In the U.S. and Europe, sulfur emissions have declined over the past three decades, especially since the mid-1990s, because of efforts to reduce air pollution.19,20 Changes in biogeochemical cycles of carbon, nitrogen, phosphorus, and other elements – and the coupling of those cycles – can influence climate. In turn, this can change atmospheric composition in other ways that affect how the planet absorbs and reflects sunlight (for example, by creating small particles known as aerosols that can reflect sunlight). The U.S. was the world’s largest producer of human-caused CO2 emissions from 1950 until 2007, when it was surpassed by China. U.S. emissions account for approximately 85% of North American emissions of CO216 and 18% of global emissions.17,21 Ecosystems represent potential “sinks” for CO2, which are places where carbon can be stored over the short or long term (see “Estimating the U.S. Carbon Sink”). At the continental scale, there has been a large and relatively consistent increase in forest carbon stocks over the last two decades,22 due to recovery from past forest harvest, net increases in forest area, improved forest management regimes, and faster growth driven by climate or fertilization by CO2 and nitrogen.16,23 The largest rates of disturbance and “regrowth sinks” are in southeastern, south central, and Pacific northwestern regions.23 However, emissions of CO2 from human activities in the U.S. continue to increase and exceed ecosystem CO2 uptake by more than three times. As a result, North America remains a net source of CO2 into the atmosphere16 by a substantial margin. The nitrogen cycle has been dramatically altered by human activity, especially by the use of nitrogen fertilizers, which have increased agricultural production over the past half century.6,24 Although fertilizer nitrogen inputs have begun to level off in the U.S. since 1980,25 human-caused reactive nitrogen inputs are now at least five times greater than those from natural sources.18,9,26,27 At least some of the added nitrogen is converted to nitrous oxide (N2O), which adds to the greenhouse effect in Earth’s atmosphere. An important characteristic of reactive nitrogen is its legacy. Once created, it can, in sequence, travel throughout the environment (for example, from land to rivers to coasts, sometimes via the atmosphere), contributing to environmental problems such as the formation of coastal low-oxygen “dead zones” in marine ecosystems in summer. 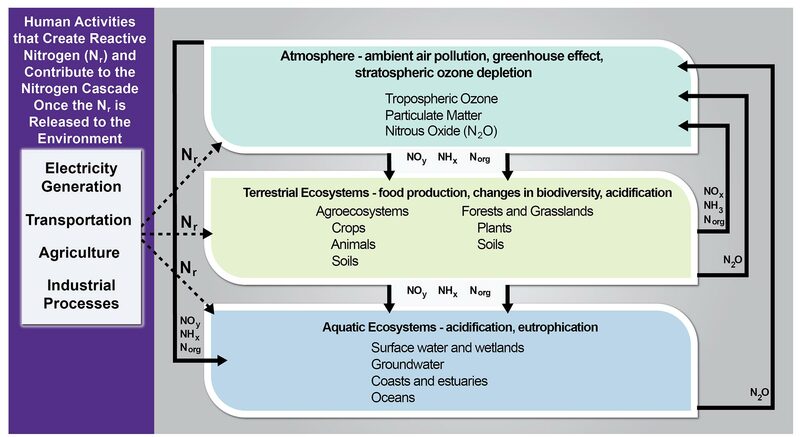 These problems persist until the reactive nitrogen is either captured and stored in a long-term pool, like the mineral layers of soil or deep ocean sediments, or converted back to nitrogen gas.7,8 The nitrogen cycle affects atmospheric concentrations of the three most important human-caused greenhouse gases: carbon dioxide, methane, and nitrous oxide. Increased available nitrogen stimulates the uptake of carbon dioxide by plants, the release of methane from wetland soils, and the production of nitrous oxide by soil microbes. In total, land in the United States absorbs and stores an amount of carbon equivalent to about 17% of annual U.S. fossil fuel emissions. U.S. forests and associated wood products account for most of this land sink. The effect of this carbon storage is to partially offset warming from emissions of CO2 and other greenhouse gases. The author team evaluated technical input reports (17) on biogeochemical cycles, including the two primary sources.1,3 The “Estimating the U.S. Carbon Sink” section relies on multiple sources of data that are described therein. While known to be significant, continental-scale fluxes and sources of the greenhouse gases N2O and CH4 are based on limited data and are potentially subject to revision. Recent syntheses33 evaluate the dynamics of these two important gases and project future changes. Uncertainties remain high. We have very high confidence that the value of the forest carbon sink lies within the range given, 7% to 24% (with a best estimate of 16%) of annual U.S. greenhouse gas emissions. There is wide acceptance that forests and soils store carbon in North America, and that they will continue to do so into the near future. The exact value of the sink strength is very poorly constrained, however, and knowledge of the projected future sink is low. As forests age, their capacity to store carbon in living biomass will necessarily decrease,22 but if other, unknown sinks are dominant, ecosystems may continue to be a carbon sink. We have high confidence that the combination of ecosystem carbon storage of human-caused greenhouse gas emissions and potential warming from other trace gases emitted by ecosystems will ultimately result in a net warming effect. This is based primarily on one recent synthesis,33 which provides ranges for multiple factors and describes the effects of propagating uncertainties. However, the exact amount of warming or cooling produced by various gases is not yet well known, because of the interactions of multiple factors. Considering the entire atmospheric CO2 budget, the temporary net storage on land is small compared to the sources: more CO2 is emitted than can be taken up (see “Estimating the U.S. Carbon Sink ”).16,41,29,42 Other elements and compounds affect that balance by direct and indirect means (for example, nitrogen stimulates carbon uptake [direct] and nitrogen decreases the soil methane sink [indirect]). The net effect on Earth’s energy balance from changes in major biogeochemical cycles (carbon, nitrogen, sulfur, and phosphorus) depends upon processes that directly affect how the planet absorbs or reflects sunlight, as well as those that indirectly affect concentrations of greenhouse gases in the atmosphere. The climate effects of an altered nitrogen cycle are substantial and complex.1,33,45,3,2 Carbon dioxide, methane, and nitrous oxide contribute most of the human-caused increase in climate forcing, and the nitrogen cycle affects atmospheric concentrations of all three gases. Nitrogen cycling processes regulate ozone (O3) concentrations in the troposphere and stratosphere, and produce atmospheric aerosols, all of which have additional direct effects on climate. Excess reactive nitrogen also has multiple indirect effects that simultaneously amplify and mitigate changes in climate. Changes in ozone and organic aerosols are short-lived, whereas changes in carbon dioxide and nitrous oxide have persistent impacts on the atmosphere. However, excess reactive nitrogen also mitigates changes in greenhouse gas concentrations and climate through several intersecting pathways. Over short time scales, NOx and ammonia emissions lead to the formation of atmospheric aerosols, which cool the climate by scattering or absorbing incoming radiation and by affecting cloud cover.34,53 In addition, the presence of NOx in the lower atmosphere increases the formation of sulfate and organic aerosols.54 At longer time scales, NOx can increase rates of methane oxidation, thereby reducing the lifetime of this important greenhouse gas. When all direct and indirect links between reactive nitrogen and climate in the U.S. are added up, a recent estimate suggests a modest reduction in the rate of warming in the near term (next several decades), but a progressive switch to greater net warming over a 100-year timescale.33,45 That switch is due to a reduction in nitrogen oxide (NOx) emissions, which provide modest cooling effects, a reduction in the nitrogen-stimulated CO2 storage in forests, and a rising importance of agricultural nitrous oxide emissions. Current policies tend to reinforce this switch. For example, policies that reduce nitrogen oxide and sulfur oxide emissions have large public health benefits, but also reduce the indirect climate mitigation co-benefits by reducing carbon storage and aerosol formation. Changes in the phosphorus cycle have no direct effects on climate, but phosphorus availability constrains plant and microbial activity in a wide variety of land- and water-based ecosystems.14,11 Changes in phosphorus availability due to human activity can therefore have indirect impacts on climate and the emissions of greenhouse gases in a variety of ways. For example, in land-based ecosystems, phosphorus availability can limit both CO2 storage and decomposition14,32 as well as the rate of nitrogen accumulation.55 In turn, higher nitrogen inputs can alter phosphorus cycling via changes in the production and activity of enzymes that release phosphorus from decaying organic matter,56,57 creating another mechanism by which rising nitrogen inputs can stimulate carbon uptake. Three low-concentration industrial gases are particularly potent for trapping heat: nitrogen trifluoride (NF3), sulfur hexafluoride (SF6), and trifluoromethyl sulfur pentafluoride (SF5CF3). None currently makes a major contribution to climate forcing, but since their emissions are increasing and their effects last for millennia, continued monitoring is important. Altered biogeochemical cycles together with climate change increase the vulnerability of biodiversity, food security, human health, and water quality to changing climate. However, natural and managed shifts in major biogeochemical cycles can help limit rates of climate change. Scientists are still investigating the impact of nitrogen deposition on carbon uptake and of sulfur and nitrogen aerosols on radiative forcing. High. We have a high degree of confidence that climate change will affect biogeochemical cycles through its effects on ecosystem structure and function (species composition and productivity). Similarly, there is high confidence that altered biogeochemical cycles will affect climate change, as for example in the increased rates of carbon storage in forests and soils that often accompany excess nitrogen deposition. Climate change alters key aspects of biogeochemical cycling, creating the potential for feedbacks that alter both warming and cooling processes into the future. For example, as soils warm, the rate of decomposition will increase, adding more CO2 to the atmosphere. In addition, both climate and biogeochemistry interact strongly with environmental and ecological concerns, such as biodiversity loss, freshwater and marine eutrophication (unintended fertilization of aquatic ecosystems that leads to water quality problems), air pollution, human health, food security, and water resources. Many of the latter connections are addressed in other sections of this assessment, but we summarize some of them here because consideration of mitigation and adaptation options for changes in climate and biogeochemistry often requires this broader context. Similarly, natural methane sources are sensitive to variations in climate; ice core records show a strong correlation between methane concentrations and warmer, wetter conditions.65 Thawing permafrost in polar regions is of particular concern because it stores large amounts of methane that could potentially be released to the atmosphere. Societal options for addressing links between climate and biogeochemical cycles must often be informed by connections to a broader context of global environmental changes. For example, both climate change and nitrogen deposition can reduce biodiversity in water- and land-based ecosystems. The greatest combined risks are expected to occur where critical loads are exceeded.75,76 A critical load is defined as the input rate of a pollutant below which no detrimental ecological effects occur over the long-term according to present knowledge.76 Although biodiversity is often shown to decline when nitrogen deposition is high due to fossil fuel combustion and agricultural emissions,76,77 the compounding effects of multiple stressors are difficult to predict. Warming and changes in water availability have been shown to interact with nitrogen in additive or synergistic ways to exacerbate biodiversity loss.78 Unfortunately, very few multi-factorial studies have been done to address this gap. Any natural or engineered process that temporarily or permanently removes and stores carbon dioxide (CO2) from the atmosphere is considered a carbon “sink.” Temporary (10 to 100 years) CO2 sinks at the global scale include absorption by plants as they photosynthesize, as well as CO2 dissolution into the ocean. Forest biomass and soils in North America offer large temporary carbon sinks in the global carbon budget; however, the spatial distribution, longevity, and mechanisms controlling these sinks are less certain.74 Understanding these processes is critical for predicting how ecosystem carbon sinks will change in the future, and potentially for managing the carbon sink as a mitigation strategy for climate change. The U.S. Environmental Protection Agency (EPA) conducts an annual inventory of U.S. greenhouse gas emissions and sinks as part of the nation’s commitments under the Framework Convention on Climate Change. Estimates are based on inventory studies and models validated with field-based data (such as the CENTURY model) in accordance with the Intergovernmental Panel on Climate Change (IPCC) best practices.82 An additional comprehensive assessment, The First State of the Carbon Cycle Report (SOCCR), provides estimates for carbon sources and sinks in the U.S. and North America around 2003.74 This assessment also utilized inventory and field-based terrestrial biosphere models, and incorporated additional land sinks not explicitly included in EPA assessments. 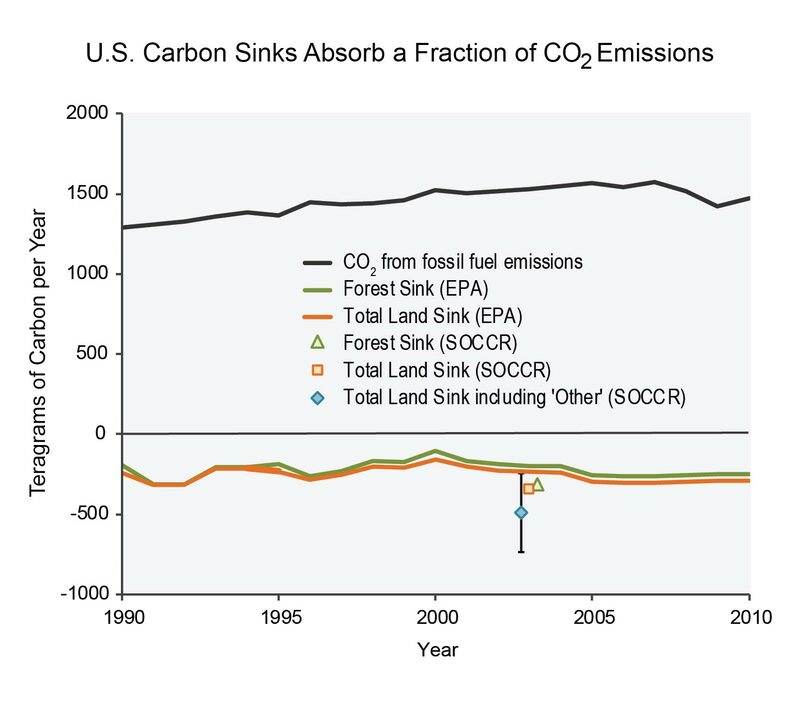 Data from these assessments suggest that the U.S. carbon sink has been variable over the last two decades, but still absorbs and stores a small fraction of CO2 emissions. 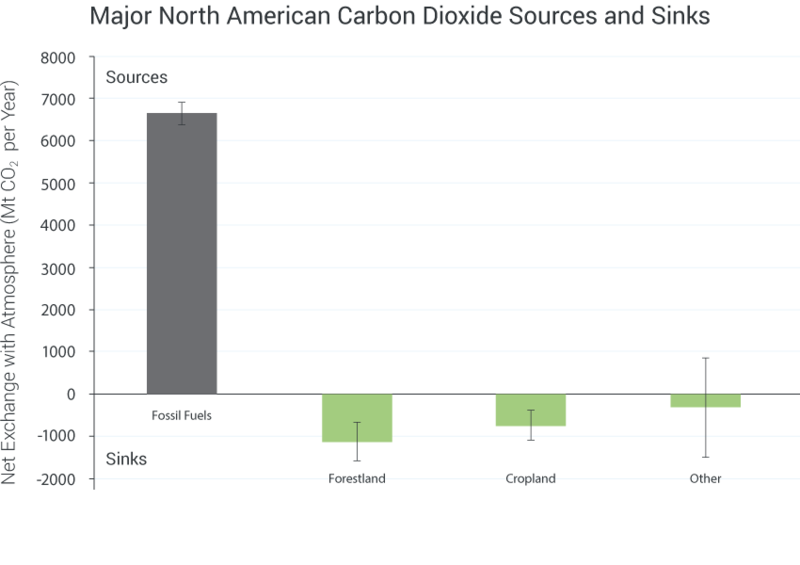 The forest sink comprises the largest fraction of the total land sink in the U.S., annually absorbing 7% to 24% (with a best estimate of 16%) of fossil fuel CO2 emissions during the last two decades. 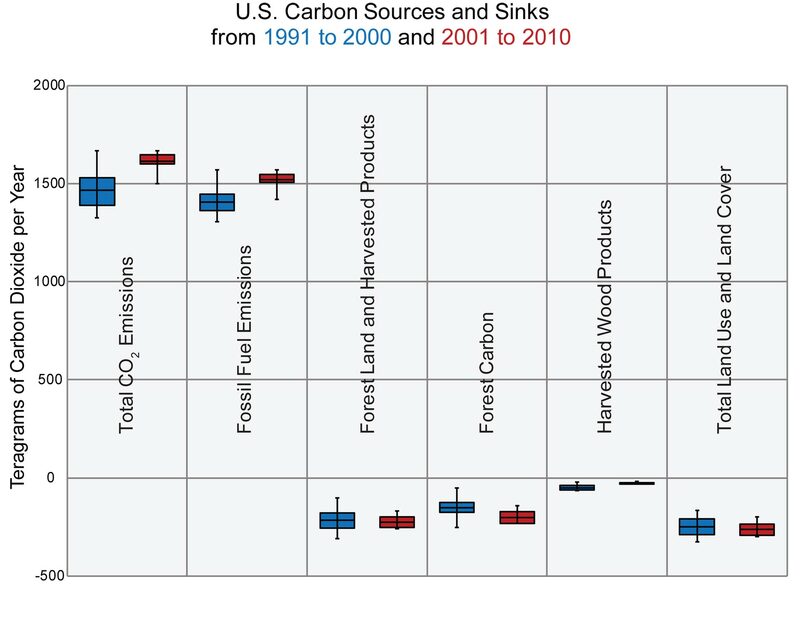 Because the U.S. Forest Service has conducted detailed forest carbon inventory studies, the uncertainty surrounding the estimate for the forest sink is lower than for most other components (see Pacala et al. 2007, Table 242). The role of lakes, reservoirs, and rivers in the carbon budget, in particular, has been difficult to quantify and is rarely included in national budgets.83 The IPCC guidelines for estimating greenhouse gas sources or sinks from lakes, reservoirs, or rivers are included in the “wetlands” category, but only for lands converted to wetlands. These ecosystems are not included in the EPA’s estimates of the total land sink. Rivers and reservoirs were estimated to be a sink in the State of the Carbon Cycle analysis,42 but recent studies suggest that inland waters may actually be an important source of CO2 to the atmosphere.84 It is important to note that these two methods use different datasets, different models, and different methodologies to estimate land-based carbon sinks in the United States. In particular, we note that the EPA Inventory, consistent with IPCC Guidelines for national inventories, includes only carbon sinks designated as human-caused, while the SOCCR analysis does not make this distinction. Table 15.1: Carbon (C) sinks and uncertainty estimated by Pacala et al. for the first State of the Carbon Cycle Report.42 Forests take up the highest percentage of carbon of all land-based carbon sinks. Due to a number of factors, there are high degrees of uncertainty in carbon sink estimates.